With very few exceptions, Americans like to smell good. In addition to showering and bathing regularly, we try to conceal our odorous emanations with all sorts of deodorants, antiperspirants, lotions, colognes, and perfumes. Have you ever stopped to think what all of that costs? According to Euromonitor International, a market research firm, Americans spent $2.3 billion on deodorant and antiperspirant in 2006. That's a lot of Speed Stick. There are other costs involved in our obsession with hygiene. One major problem with antiperspirants is that they inevitably stain your clothes. White shirts develop yellow stains from the toxic chemicals used to keep your armpits dry. Companies have recently started coming out with new formulas designed to minimize yellowing, but they are even more expensive than the regular stuff. Deodorants, on the other hand, simply don't work. At all. If you like the smell of B.O. with a touch of lilac, then store-bought deodorant is your best choice. I know what you're thinking: "Are there any alternatives?" I'm glad you asked. A brief perusal of the internet will yield a wide range of interesting and creative suggestions for fighting body odor. There is one in particular that has worked for me, and now instead of spending hundreds of dollars each year on products that really don't do what they're supposed to do, I spend a few bucks on a solution that has proven to be 100% effective. Stir the ingredients together until they are thoroughly mixed and store in a small jar or Tupperware container. (Coconut oil is solid at room temperature, so you may have to heat it in the microwave or in a saucepan to make mixing easier.) To use, simply scoop a nickel-sized amount on your fingertips and apply under your arms. 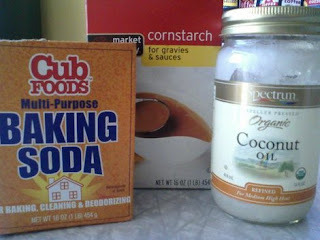 The baking soda fights the bacteria causing underarm odor, and the corn starch absorbs moisture. The coconut oil holds it together in a nice paste, and since it melts at about 76° F, your body heat makes application very easy. (I prefer refined coconut oil because it doesn't smell like coconut.) I can only speak from personal experience, but this stuff works better than any deodorant I have ever tried, and I've tried a lot. The nice thing about this homemade deodorant is that you can experiment with the formula to find a mixture that suits your particular body type. For example, someone with more sensitive skin may want to use less baking soda, or even add some aloe during the mixing process. Those who like their deodorant to have some fragrance can add a dash of scented oil (e.g. tea tree oil). The combinations are virtually endless. Of course, the best thing about it is that it works. Again, I can only speak for myself, but there have been many occasions in which one application has lasted over 36 hours -- and several of those included mowing the lawn in 90-degree heat. So, if you're tired of expensive deodorants that don't work, stop complaining and just make your own. What have you got to lose?